We’ve spent hours glued to the tube, watching the Olympics lately. We’ve Tivoed nearly everything, so we’ve been able to catch some of the lesser known sports like: BMX racing, shotput, badminton, table tennis, shooting, trampoline, and weight-lifting. The other night we were watching wrestling when we heard a familiar voice… it was Rulon Gardner. 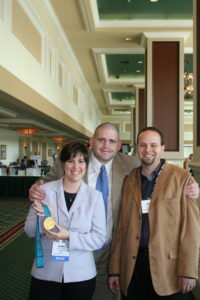 Rulon won a gold medal in wrestling and became quite a media sensation. Brett and I met him at one of my conferences where he served as our keynote speaker. Since I used to serve as the onsite contact for the keynote speakers, I got to know them as well as you can in a few hours. 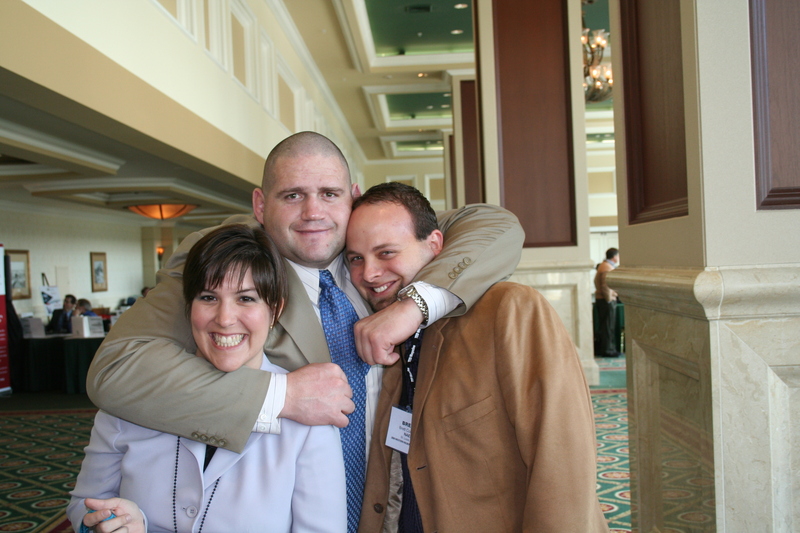 In honor of the Olympics, Brett and I thought we’d share our Olympic moment, which included a headlock by a very strong and fun guy! And yes, I did get to hold the gold medal. Quite nice. The final photo is fabulous!